Inside, you’re assured of first-class service, helpful and knowledgeable staff, and great product choice and availability. As well as the usual trade paints, we carry an extensive designer paint range and, as protective coatings experts, we stock, supply and advise on all manner of specialist coatings and applications. We also have a kitchen showroom, where you can book a kitchen design consultation, and a good selection of wallpapers, fabrics, curtains and blinds. 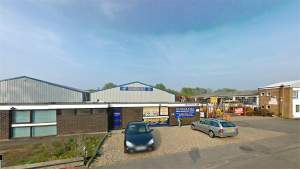 You’ll find our Ware Brewers Decorator Centre on the Marsh Lane Industrial Estate just off the A1170 London Road. We’ve been part of Brewers since 2009, but some of our longstanding customers still refer to us as Homerama. We have dedicated customer parking right outside and the showroom is easily accessible for wheelchair users. Follow the A119 and take the first exit at the roundabout, shortly after take the second exit onto Marsh Lane. Follow the A1170 Northbound and at the roundabout take the second exit, shortly after take the second exit onto Marsh Lane. Follow the A1170 Southbound and at the roundabout take the first exit onto Marsh Lane. Follow Marsh Lane and the store will be towards the end on the left.